Blanch kale in boiling water for 20 seconds; drain and put in a bowl of cold water to stop cooking; once cool, squeeze dry and roughly chop. 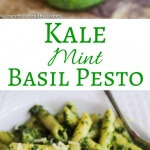 Place blanched kale, basil leaves, mint leaves, garlic cloves and pine nuts in food processor bowl; process until finely chopped; add oil through feeding tube until pesto is blended. Season to taste with salt and pepper.